Hair care brand, TRESemmé from FMCG major Hindustan Unilever Limited is making an impact in the hair care products market in India. Furthering its position in the premium hair care segment, TRESemmé India is being seen across all mediums talking about giving the consumer an experience of ‘ramp ready hair’. The brand has launched an interactive salon through its YouTube channel hosted by actress and brand ambassador Diana Penty with DIY videos that take a step-by-step approach for the featured ramp ready hairstyles. TRESemmé has also reached out to bloggers inviting them to check out the interactive YouTube channel, pick a hairstyle they like, try it and blog about their experiences. The interactive salon on YouTube with demo videos for ramp ready hairstyles is the highlight of the campaign. Diana can get you exclusive virtual access to a fashion show and show you all what happens before a ramp walk. You can pick a hairstyle and learn how to do it yourself. The neatly designed brand channel loads with a background music while Diana invites you to the Mercedes Benz Fashion week to learn more about her ramp ready hair. The virtual salon has many areas to get you started with. You can learn to style your own hair with the Do it yourself videos by clicking on ‘Watch DIYs’ or click the ‘Help Screen’ that gives you a visual layout of the channel with instructions to what you can do next. At the bottom are dots that represent different events; you can click on any dot to jump directly to it. ‘Start’ will take you to the welcome message by Diana and the invite to visit backstage. You are then given options to proceed to backstage or skip to the DIYs section. If you select to visit the backstage, Diana will ask for your name and photograph to get you an access card. The image for the photograph can be pulled up from Facebook, your computer or from your webcam. Once you are in, you can then create your own ramp show by selecting at least 3 hairstyles, learn about the shampoos by selecting your hair type and then actually go through the DIY videos for each of the hairstyles you have chosen. The last event at the interactive salon is viewing your own style album with pictures of the virtual show and some hairstyles for the different hair types along with the DIY videos for the same. The YouTube salon also provides you options to select your viewing experience; by default it loads in low definition. You can play and pause at anytime during a video. Besides, you can also share your experience with your network on Facebook and Twitter. 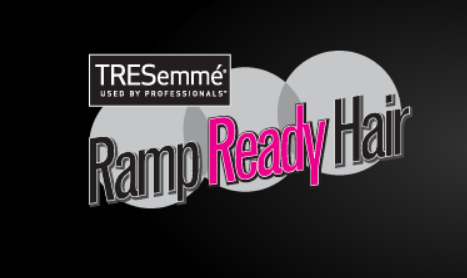 TRESemmé has partnered with Indiblogger, a community of Indian bloggers to host the ‘TRESemmé Ramp Ready Hair’ blogging contest. Bloggers have been invited to choose a hair style for themselves from the YouTube channel. Try it and blog all about their experiences. And there are 15 Samsung Galaxy Tabs, 30 Panasonic hair straighteners and 55 Shoppers Stop gift vouchers to be won! The contest invites fresh entries and will be judged only on creativity, not on votes. The only thing it mandates is a link to the YouTube channel, so the blog readers could be aware of it too. 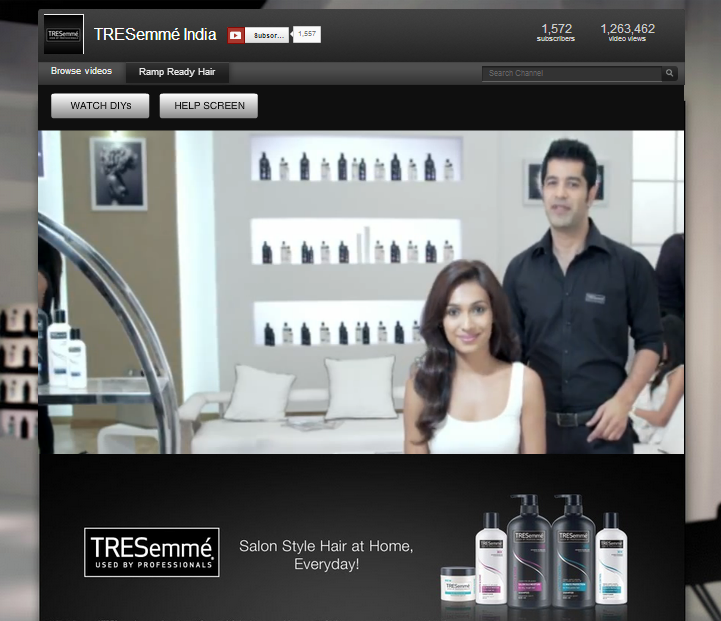 In a crowded place for the hair care segment, TRESemmé seems to have made a mark with the interactive salon experience on YouTube. I had a great time learning some of the hairdos and this experience has given me the faith to give up my favourite shampoo and give a try to TRESemmé. The concept is a winner – on the one side, it gives consumers valuable information with do it yourself video tutorials and on the other it talks about the brand, associating it with the much desirable ‘ramp ready hair’. The noteworthy thing is that the brand has also integrated all its social media networks to spread the message. The Facebook community of 281K fans is being driven to the virtual salon along with the Twitter followers of the brand. The blogging contest not only drives the readers but also helps spread to their network. The YouTube channel has garnered 1586 subscribers with 1.2 million video views, as I write this. In addition, the channel also makes use of sharing buttons for viewers to share on their Facebook and Twitter pages. All this coupled with promotions on other mediums, ensures that TRESemmé has it all covered. Although this isn’t an innovative idea, the design is well executed nevertheless. Smooth navigation, easy instructions and user control make for a good user experience. Last year, Sunsilk had launched an interactive salon on YouTube, which was swell then. I love doing up my hair, and am certain to try the twisted side bun with the DIY videos. This campaign surely works for me as well as every other woman always on the lookout for better looking hair. Does it work for you?